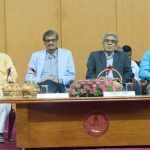 Palaj, Gandhinagar: A Symposium of the International Association for Computer Methods and Advances in Geomechanics (IACMAG) was held at the Indian Institute of Technology Gandhinagar (IITGN) during March 5-7, 2019. The IACMAG Symposium was focused on the three main themes of 1) Earthquake Engineering, 2) Ground Improvement, and 3) Constitutive Modelling. The symposium provided a forum for exchanging new experiences and discussing future developments of geomechanics and geotechnical engineering. About 200 delegates attended the three-day symposium including delegates/participants/presenters from Chongqing University, China, Kyoto University, Japan, University of Arizona, University of Oklahoma, and University of San Diego, USA. Industry leaders and experts from Indian Railways, Delhi Metro, Engineers India Ltd, Nuclear Power Corporation of India Ltd, National Hydroelectric Power Corporation, Bhakra Beas Management Board, Central Water Commission, Adani Group, also participated in the symposium. 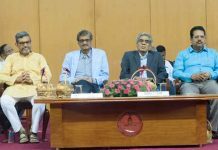 The symposium had 8 keynote lectures by speakers from India and the US and many technical presentations by PhD scholars covering the scope of themes and sub-themes of the symposium. Mr. Kamlesh Kumar, former Additional Director General and Advisor to Minister in Ministry of Road Transport & Highways (MoRTH), delivered inaugural lecture on “Need of new technologies to meet growing infrastructure demand in India”. He gave an idea about country’s economic scenario, short-term and long-term targets for economic growth. He said that there is close relation between transport sector and economic growth. Describing transport infrastructure as a catalyst of growth, he said, “There is still gap between rural and urban infrastructure which needs to be filled in order to enable rural areas contribute to the development. We need to improve our secondary road network. It will drive rural incomes, benefit urban masses from accessibility to rural products, and reduce pressure on urbanization.” In conclusion, he stressed upon need for providing less expensive and better infrastructure with the help of demand and supply of cost-effective technology. A session of International Geosynthetics Society India was also held today, on March 7, 2019 with substantial industry participation from companies such as Garware wall ropes, TechFab India Pvt Ltd, Maccaferri and Strata. iGrip (Initiative for Geotechnical Research and Innovative Practice), a unique single source platform for information on Geotechnical Engineering for teaching and learning purposes, was launched as part of the international IACMAG symposium. The centre helps to spread the awareness from undergraduate level to research level by providing collection of authentic resource material containing modern techniques and practices applied in Geotechnical Engineering. The platform, an amalgamation of academia and industry, also aspires to help various organizations and industries interested in conducting workshops and short courses.